We are all aware that Billy Costello left the employ of Max Fleischer’s cartoon studio in 1935. We’re not quite sure if it was a matter o’ money, or ‘bad behavior”–and it’s really neither here nor there. We also know that there’s an odd duck in the pond, in the form of Be Kind To ‘Aminals’, on which an absolutely different voice appears as Popeye. This voice is more gruff, and doesn’t have the same timbre as Costello—who built his Popeye voice on noises he made earlier in his career, and on the work of ‘Gene Greene and Poley McClintock. 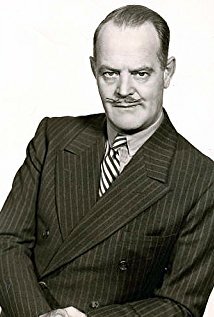 We know that, in this cartoon, this voice belongs to Floyd Buckley, a Broadway actor who had a long career, mostly in minor roles, stretching from early silent serials to early telefilms. Up to then, his biggest role had been as “Q The Automaton”, the “dog-heavy” (to use a fandom term) of the 1919 serial “The Master Mystery”–which starred Harry Houdini. You don’t see all that much of him there, as he’s wearing a water-heater-on-legs that sufficed for a mechanical man in the days before the term “robot” was coined. Buckley is known among fans as “the radio Popeye”, for his broadcasts in a three-a-week series pushing Wheatena, a hot wheat cereal that is still on the market,after going through divers hands over the generations. What’s curious is that “Be Kind To ‘Aminals'” was released seven months before the radio show premered on the NBC Red Network. Anyway, Buckley did gain some minor fame as “radio’s Popeye”. And he was famous enough to make records. In late 1936, Bluebird records-the low-priced (35 cents) subsidiary of Victor Records–was making some stabs at the market–such as there was–for children’s records. Buckley cut four sides, accompanied by a six-piece “novelty” orchestra, and assisted by Olive LaMoy, who was the Olive Oyl of the radio series. Each of the four sides is a medley. consisting of three songs. And most of them are songs that appeared in Popeye cartoons. In fact, the only ones I don’t recognize as being from the cartoons–and their melodies may have appeared in the scores, for all I know–are “Popeye On Parade”, “Fooey To You From Me”, “I Spy A Spy”, and “”Olive Oyl’s Family Reunion”. Buckley sings most of them in his gruff Poeye voice–but a real surprise comes when we get to “I’m Sinbad The Sailor”. Buckley appears to be singing this in a dramatic high baritone/low tenor voice, which may be his natural tone of voice. The Bluebird records also came out on Montgomery Ward, and were sold (presumably for less than thirty-five cents) out of their periodic mail-order catalogues. Four episodes of the radio series have circulated for years among collectors of old-time radio. They first came out on an LP that George Garabedian put out on his “Mark 56” label in the 1970’s. And they are pretty easily found on various sites on the Internet. 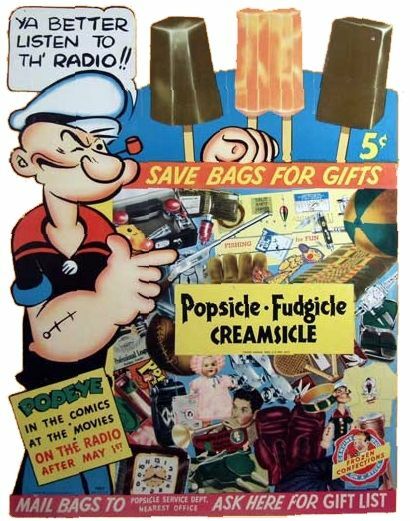 Nobody’s yet found any of a 1938 Popeye series sponsored by Popsicle — which only ran a fairly brief while. This may be the series that features one Detmar Poppen — anoter Broadway actor with a pretty decent resume — as the Sailor Man. By the way: the title of this and last week’s posts comes from “Sailor Man Rhythm” by Frank Tanner and his Orchestra. Tanner had a middle-sized orchestra, which recorded for Bluebird at one of their “field trips” to San Antonio, Texas, in October, 1936. It’s actually a fairly interesting band blues, with the band chanting “Popeye, the Sailor Man”–for no apparent reason–behind the second vocal chorus. Next Week: If at first You DO Succeed. . .
A fascinating post. That always baffled me, too…..in that one film!!! Costello never did as well with his ad-libs as Jack Mercer did — he usually just commented on the action on screen or mumbled something about how great he was — but he was softening his tone a little bit by the end of his run, to go along with the less-gruff character Dave Fleischer, Seymour Kneitel and Willard Bowsky were going with by the end of 1934. Buckley’s voice tonally goes in the exact opposite direction — aside from the jarring difference between him and William Costello, there’s no hint of warmth in it. No wonder the studio decided to look elsewhere and go with Mercer (and Kneitel & Co. didn’t make the same mistake a decade later when Mercer was in the Army, finding someone who came a lot closer to mimicking the original Popeye voice in Harry Foster Welch). Wow, didn’t even realize that Popeye had a radio program back then. The other songs Buckley sings are from the 1930s’s “Popeye’s Song Folio”, which has a mix of songs from the cartoons, and original compositions, previously unused. They show up on Ebay every now and then, and are a great collector’s item, since all of the headers are illustrations by Fleischer animators. Allen Swift would later sing a couple of these non-cartoon songs on records of his own, such as “Popeye on Parade”, and “Strike Me Pink, Do I See Red”. The only strange thing is that “King of the Marti Gras” (which was Mercer’s first cartoon) only has its refrain in the booklet, and is missing the rest of the song. Still, it’s great to have sheet music for these wonderful cartoons in any form. It would be interesting to see some of those “Popeye’s Song Folio” headers with illustrations.